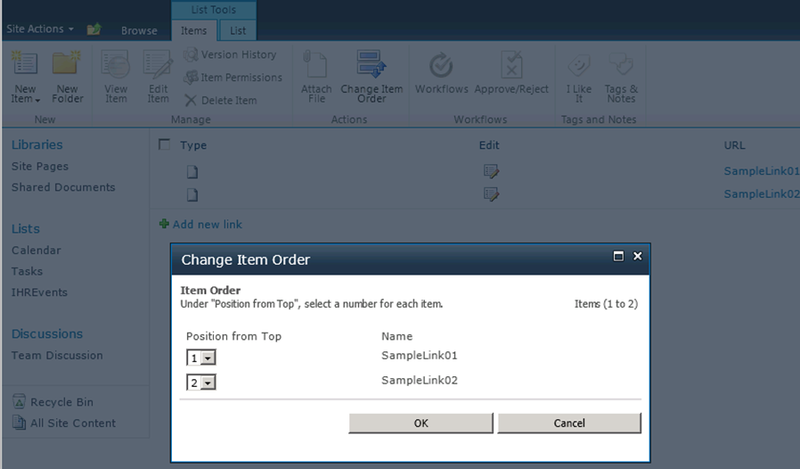 The functionality to “Reorder list items” is inbuilt for “Links” lists both in SharePoint 2010 and SharePoint 2013. 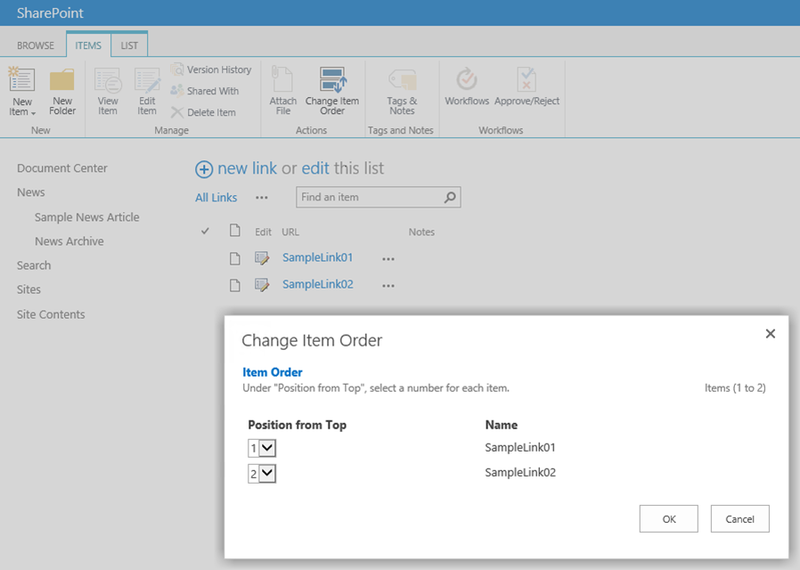 “Change Item Order” option in SharePoint 2013 Links List. 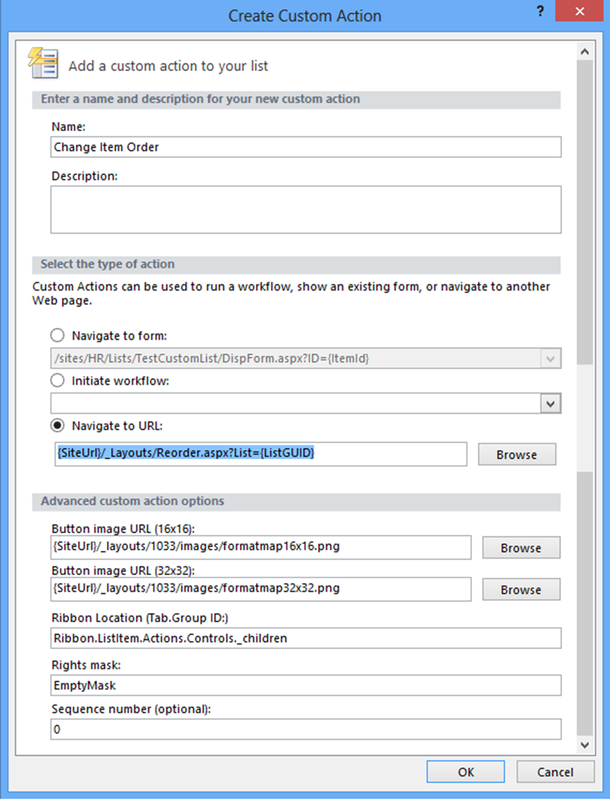 “Change Item Order” option in SharePoint 2010 Links List. How does this “Change Item Order” button work? 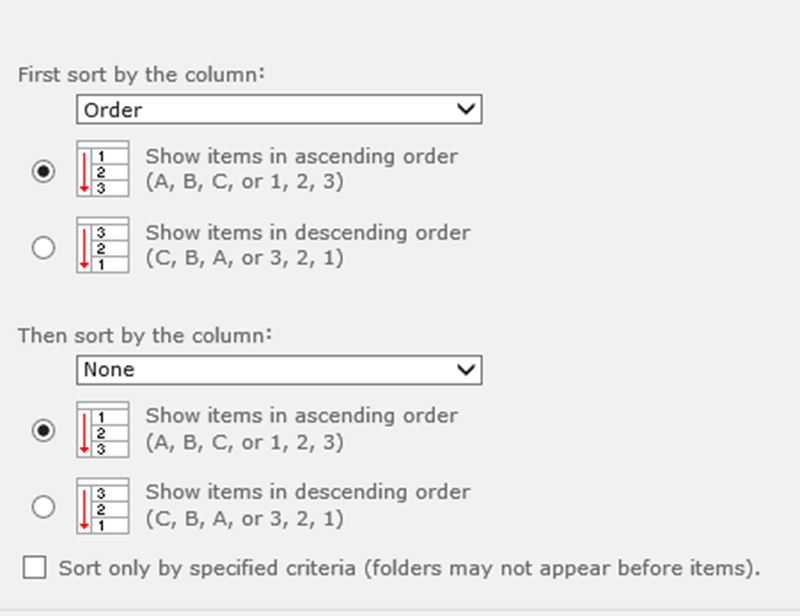 SharePoint uses hidden column “order” to set the order. When we select the “Change Item Order” option, SharePoint uses “/_Layouts/Reorder.aspx?List=ListGUID” page to reorder the list items. But this wonderful feature is hidden for other list templates and only available with OOTB Links Lists. I wonder why? In this blog post I have listed different methods we can use to enable this feature for other lists. Method 1: Use Console Application/PowerShell script. This method is preferable because we can reuse it for different lists with ease. We just need to provide the site url and the list name. C# Console Application: You can download this file from here. /// Order Default view by field "order"
PowerShell Script: You can download this script from here. Method 2: Use SharePoint designer and PowerShell. 1. Since “order” column is hidden, we need to use following PowerShell script to make this field visible. Once this field is visible, we can use it in List Views. You can download this script from here. # Change List Schema to unhide order field. 5. Click OK. This will add the custom action in the list ribbon as shown below. 6. Next step is to modify the default view of the list and sort the items by field “Order”. Note : “Change Item Order” option does not modify the version history of list items. So if you are using Content Deployment, reordering the list items will not move changes to target environment. This entry was posted in SharePoint 2013, SharePoint 2013 Development and tagged Content Deployment, PowerShell, Prashant Bhoyar, Prashant G Bhoyar, ReOrder, ReOrder SharePoint List Items, SharePoint 2010, SharePoint 2013, SharePoint Designer. Bookmark the permalink. Quality content is the crucial to attract the visitors to go to see the website, that’s what this website is providing. Weird things when I change the items order it assigns all the changed links order = 350. Weird thing, when I change an items order the order number becomes 350 for all the items that I change the position. if I change the order of the links all order number will become 350.